Don’t let these initial box office returns deceive you though. Director David Fincher (Zodiac) and screenwriter Aaron Sorkin (The West Wing; Sports Night) have created a film that will sneak up on you much like the social networking website it is about. We begin in a Boston bar. Mark Zuckerberg (Jesse Eisenberg) and his date Erica Albright (Rooney Mara, in a small but significant role) are discussing one of Harvard’s many elite clubs that Zuckerberg is obsessing over. After one insult too many (“You don’t need to study. You go to BU.” – a line that was great to hear uttered in a Boston movie theater), Erica dumps Zuckerberg. In the drunken night that follows, Zuckerberg posts defamatory comments about Erica on his Livejournal (it really is 2003! ), hacks into the Harvard server, and creates the foundations for what will become Facebook. You spend the entire film waiting for someone, anyone to bring Zuckerberg’s brash, often rude behavior, and frequent neglect for those closest to him to a crashing halt. 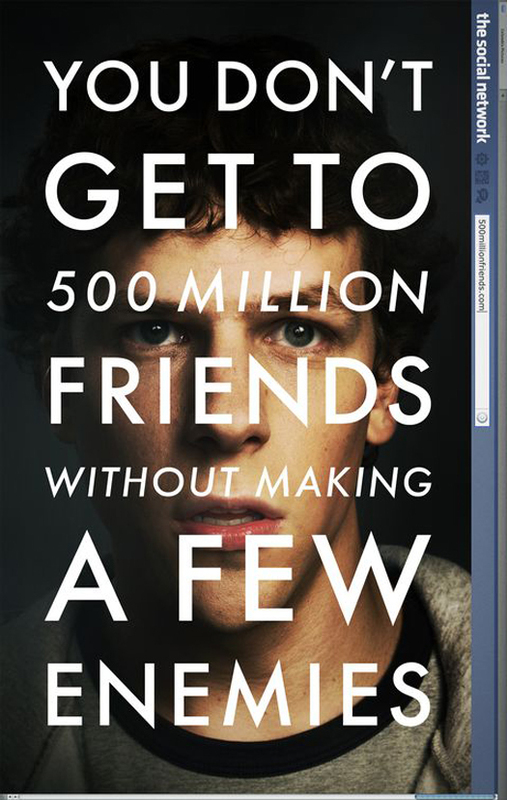 When this happens, thanks to the harsh words of Erica Albright and Eduardo Saverin, The Social Network is at its best. This is a film bathing in exceptional dialogue if there ever was one. The credit for this can easily go to Sorkin, but in the hands of a director less than Fincher, the brilliance of the dialogue could easily be lost and misguided. What The Social Network captures with its witty and often awe-inspiring dialogue is this questioning of what is a friend, a concept that Facebook has completely changed. Did Zuckerberg really create Facebook to get back at Harvard’s elite group to which the Winklevie belong? Did Zuckerberg really cross his best friend like that? Will Erica Albright accept Zuckerberg’s friend request as a sign of his personal redemption? Because of the intentional voids left by the filmmakers, we are left to our own conclusions. Much like how we are left to design our own Facebook page, select the information we share on our profiles, and what we consider to be the difference a real friend and a Facebook friend. Thanks! I think you’ll enjoy it. Let me know what you think! I loved Social Network. I’m disappointed that it didn’t win Best Picture. Next Next post: Inception – 1950s Hitchcock style!